The Hejaz used the Arab Revolt flag  black, green, white horizontally with a red triangle in the hoist. In 1921 or thereabouts the white and green were swapped, making it like the modern Palestinian flag, which is directly derived from it. After the fall of Hejaz the colors were used by Husain's sons 'Abdulla (emir of the Transjordan) and Faisal (king of Iraq). Later on they became known as the Pan-Arab colors. The Kingdom of Hejaz disappeared in 1924-25 when Emir Abdul Aziz of Nejd drove the Hashemites out of Mecca, Medina, and Jeddah, leading to the creation of the Kingdom of Saudi Arabia. The flag of the Hejaz was designed by Sir Mark Sykes of the British Foreign Office for the Arab forces under the Sherif Hussein operating with Allenby in Palestine. Hussein modified the shade of red, but I do not know what the original shade was. The original issues of the flag were manufactured by the British military in Egypt. 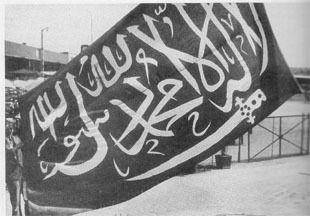 Among their banners was one designed by Sir Mark Sykes for Hussein [Sharif of Mecca] and the Arab cause. Its colors black, white, green, and red were meant to symbolize the past glory of Moslem Arab empires and to suggest that Hussein was their contemporary champion. Hussein's only modification of the design was to change the hue of the red. Sykes had ordered flags to be made up by the British military supply offices in Egypt, and then had them delivered to the Hejaz forces. We [King Faisal of Iraq, Gertrude Bell and others] then spent a happy hour discussing (...) the national flag and Faisal's personal flag. For the latter we arranged provisionally this [sketch] i.e. the Hijaz flag with a gold crown on the red triangle. The red I must tell you is the colour of his house so he bears his own nom[en] on it. Father, do for Heaven's sake tell me whether the Hijaz flag is heraldically right. You might telegraph. It's a very good flag and we could differentiate it for the Iraq by putting a gold star on the black stripe or the on the red triangle. The Congress will settle it directly it meets  do let me know in time. Also whether you have a better suggestion for Faisal's standard. There's a hint in there (the question to Gertrude Bell's father as to the heraldic correctness of the Hijaz flag) of where the change in the sequence of the stripes may have come from. A purist might well have objected to placing black and green together. At that point (1923 is the year I am quoting) Hejaz's flag was black, green, white horizontal stripes with a red triangle at the hoist. (...) This came from some research William Crampton did for me when I was doing a historical map of the Middle East showing the changing borders this century. I wanted to make sure that for each year we featured the flags were the correct ones. Jordan used the same flag as Hejaz from March 1921. I wonder if Jaume Ollé is actually saying that Hejaz changed the order of its stripes to black-white-green on March 1921. Since the Transjordan Emirate was also created c.1921, the obvious question is, did it ever use the black-green-white flag? Or did it use the black-white-green flag before Hejaz did? The German Navy's Flaggenbuch 1926 shows the flag of Hejaz with a short triangle in a flag of 2:3 (labelled Hedschas und Irak). "The new Kingdom of the Hedjaz has chosen an excellent flag, black, white and green, horizontal, with a red triangle based all down the hoist and having its apex two fifths of the flag's length in the middle of the white; and Iraq is under the same flag owing to King Feisal of Bagdad having been the son of King Hussein of Mecca. The same flag is also flown by Trans-Jordania." 1932. Hejaz and Nejd became the Kingdom of Saudi Arabia. The National Geographic (1934), page 344, has a half-page photograph of the flag flown during the visit of the King of Saudi Arabia to Germany in 1932. It is similar to the present Saudi flag except that the inscription and sword completely cover the whole flag. In spite of this no flag is shown for Saudi Arabia in the coloured section of national flags. Perhaps it was thought that the flag in the photograph was a Royal Flag and that Saudi Arabia did not have a National Flag? In E.H. Baxter's "National Flags" (1934); "The National Flag is formed of a green square and a narrow white strip at the staff; on the green square is an Oriental motto with a sheathed scimitar below it both in white. This flag is said to have been designed about a hundred years ago by the grandfather of the present King. Proportion 8 : 7." He goes on to give the dates on which the National Flag is flown. This flag is repeated in a number of publications until 1950 when an appendix to the "Book of Flags" by Campbell and Evans has, "The flags have been altered. The Arabic words now appear above a white scimitar on the Royal Flag and above two crossed swords on the National Flag. The field is green, but a narrow stripe in the hoist is white." 1953 "FOTW" by H. Gresham Carr. "The Royal Standard and the Ensign are the same as the National Flag, except for the sizes of their fields, and the Ensign has an additional charge in the form of a small white anchor in the upper corner of the fly. The Army and Air Force use the National Flag. In accordance with decree 18/1/1356 A.H., the National Flag is 150 by 100 centimetres, the Royal Standard 250 by 230 centimetres, and the Ensign is 150 centimetres square. The Merchant Flag is unique in that it is triangular in shape (each side being 140 centimetres); the two white swords in saltire are placed in the centre of the flag and a small white anchor in the upper hoist." Illustrations of the Ensign and National Flag have crossed swords. A web-site translates 18/1/1356 Anno Hegirae as 31 March 1937. In the 1959 Observer's Book of Flags, Evans, who co-authored the 1950 "Book of Flags" in which the Royal Flag was said to have one sword, now wrote that the Royal Standard was similar to the National Flag which had two crossed swords. His 1966 edition is the same, but in the 1975 edition all flags, except the Merchant Flag, have a single sword. Editions of "FOTW" have the same information as the 1953, sometimes abbreviated, until 1971 when on page 195 E.M.C. Barraclough wrote, "Now the Saudi Arabian flag has only one white sword", but on page 196, "Sometimes the Saudi-Arabian flags have only one white sword instead of the two in saltire." The Grand Larousse Illustré du XXe siècle (1929) shows a rather strange flag for Hejaz. The flag is horizontally divided black-green-yellow with a red rectangle triangle placed along the hoist. I believe that this flag is an erroneous interpretation of the real flag of Hejaz, which was horizontally divided black-green-white with an isoceles red triangle placed along the hoist. The Grand Larousse has the following historical details on Hejaz: During the Ottoman era, Hejaz was a vilayet. Sherif Hussein, Emir of Mecca (1906), ruled the sovereign kingdom of Hejaz from 1916 to 1926, when he was overthrown by the emir of Nedjd. Since then [note that the source date is 1929], Hejaz has been an autonomous dependency of Nedjd, with a Vice-Roy and a Constitution granted on 29 August 1926. The proclamation of the Kingdom of Saudi Arabia in 1932 might have suppressed the autonomous Hejaz. In 1993, the kingdom was divided in 13 administrative regions, none of them being called Hejaz. I note that http://www.worldstatesmen.org/Saudi_Arabia.htm#Jebel%20Shammar shows a flag as described by Ivan for the emirate of Ha'il or Jebel Shammar, 1920-21.